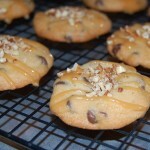 A decadent chocolate chip cookie topped with caramel drizzle and chopped pecans! Preheat oven to 375 degrees. Combine flour, baking soda and salt in a small bowl; set aside. Beat butter, granulated sugar, brown sugar and vanilla extract in large mixer bowl until creamy. Add eggs one at a time, beating well after each addition. Gradually beat in flour mixture. Stir in chocolate chips. Drop by rounded tablespoon onto ungreased baking sheets. Microwave caramels and cream in a small bowl, stirring occasionally, until smooth, 1 to 2 minutes. 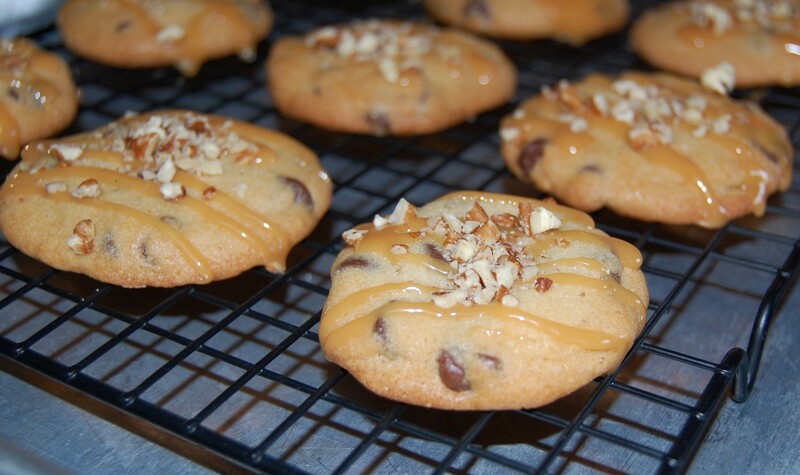 Drizzle caramel over cookies and sprinkle with chopped pecans.